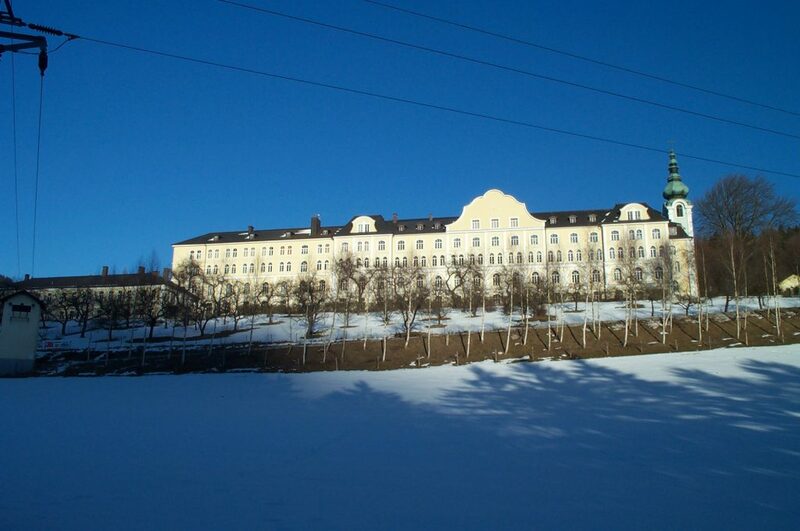 The first time I’d ever heard of Bischofshofen was in the early winter of 2001-2002 when I was sick at home watching EuroSport on the television. 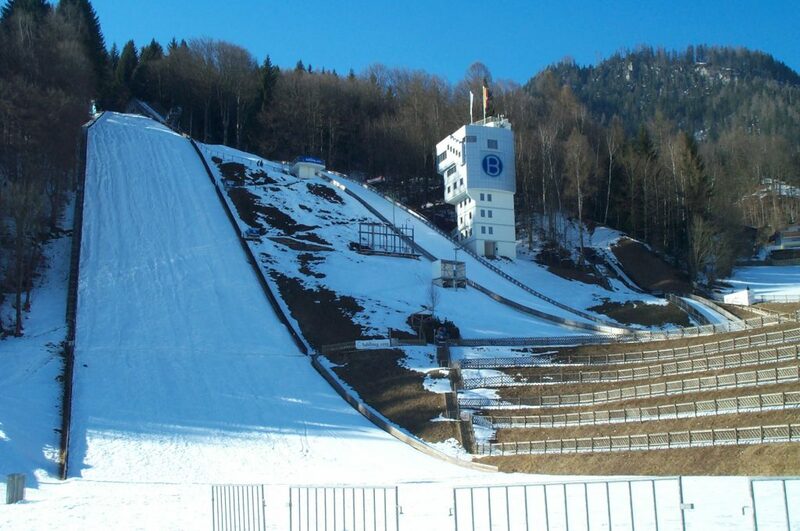 It was the early days of ski season, and I watched live ski jumping from the Bradl-Stadion there. It was jam packed with people watching the skip jumpers from the terraced stands at the bottom of the jump. The competition was quite intense, and the crowd was very much into it — all of them bundled up in multiple layers braving a fierce snowstorm. EuroSport still had a blimp or aerial camera somewhere that panned over the town and its gorgeous Alpine environs around commercial time, and it made me think, “I need to get out there sometime.” Well, I did, in the later part of winter when it was not too cold but still plenty of snow on the ground and lots of terrific winter scenes to behold. In an area where one would expect Alpine skiing to dominate, I was surprised to see how many of the locals were into Nordic events. The tall hills and wide plateaus around Bischofshofen were filled with cross-country skiing paths, and a significant number of locals were out there getting terrific exercise. One area near the stadium had a plowed cross-country oval, roughly three times the size of a running track, that seemed to be part of a regimen for some locals. 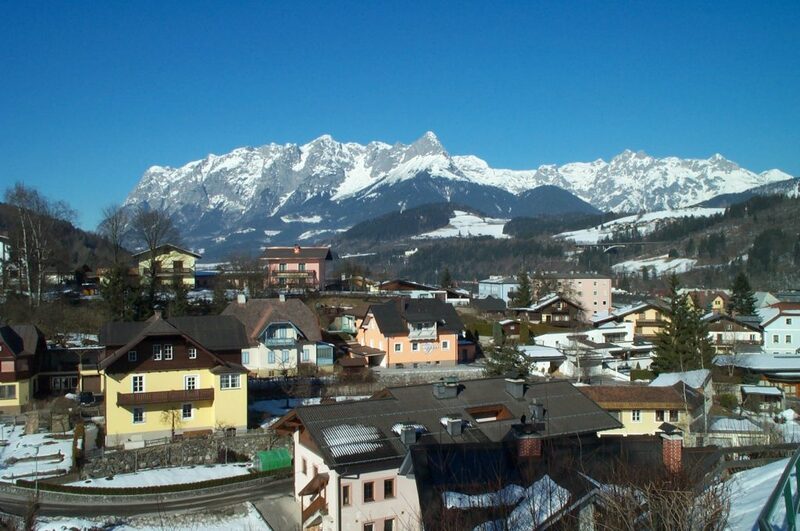 The beauty of Bischofshofen was much more in the surrounding regions, and not so much the town itself. The town follows along a major road on the north bank of the Salzach River as it winds toward Salzburg, with the predominance of shops following the main road. There were several points of interest in the downtown. 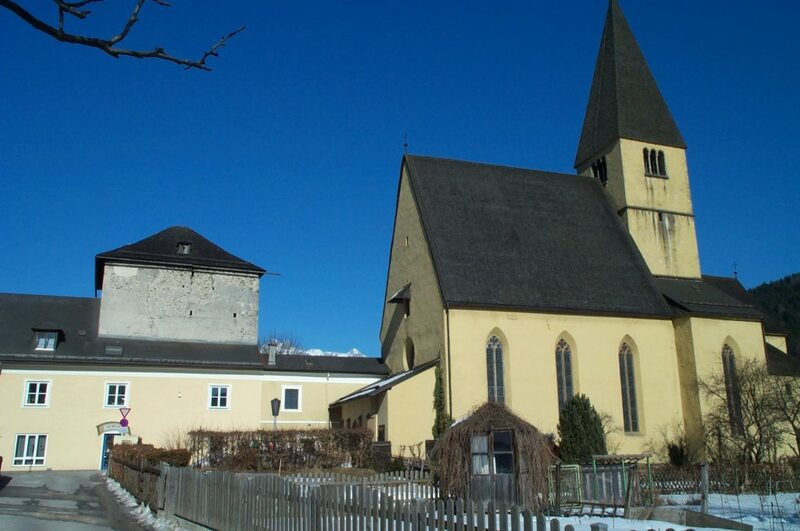 Two of them are shown in the above photo, the Pfarrkirche at right and the Kastenturm (the concrete block) at left. These two structures are part of the Rathausplatz, which is a large square building with a piazza in the middle. The wall below the Kastenturm is part of that building. Surprisingly, though, the Rathaus takes up only one side while the rest were residential, not municipal buildings. The inner town is a maze of tiny streets that twist and incline precariously. Scattered among them were guesthouses like the ones shown in the below photo, beautifully decorated and very inviting. 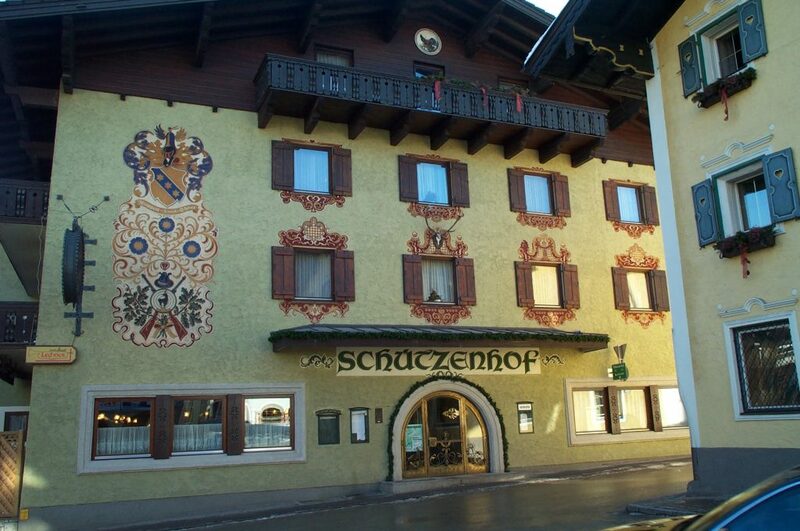 The quantity of guesthouses and restaurants suggest that in high season, and assuredly during major events, Bischofshofen does very well. Other points of interest included the town’s most prominent structure, the Frauenkirche (Church of Our Lady), with its single concrete spire. The Frauenkirche sat directly above the Rathaus, and a common post card shot showed the Pfarrkirche and Frauenkirche together. Further above was a tiny chapel known as the Georgikirche (Church of St. George). This chapel sits at one end of the town cemetary, and across from its entrance is a very impressive war memorial (the Kriegerdenkmal) that is a fifteen-meter long cement wall with reliefs depicting soldiers in battle or at home. The cross-country oval I mentioned earlier was beyond the cemetary, as was the Sprungschanze, the ski jump, shown in the next photo. There were three jumps. The stadium comprises the longest jump, in the left. A smaller jump, probably for training purposes can be seen at right just below the tower, while a beginner’s jump can be made out at the right edge. When I visited the stadium, there was a family present, and the young boys (I think maybe six or seven years old) were busy honing their skills. A series of mountain trails extend from the stadium, and I walked a couple of them that were not too dangerous in the snow. One went to a forty-meter waterfall that is a main attraction in the summer — a wooden staircase climbed the steep gorge to the very top. The waterfall was frozen over, but parts of the ice had melted away, leaving visible the torrent water falling behind it. At the top of the hill, sitting on a high plateau over the city, was a 12th Century castle ruin known as the Burgruine Pongowe (Pongau Castle Ruins). Unfortunately, the mountain path was completely snowed over and the only way to get up there safely was with cross-country skis. Better in the summer. I walked back down and followed the town eastward into its main residential areas, and found myself rather impressed. A series of new and beautiful apartment complexes appear to have recently sprung up, and are populated (as near as I could tell) by young families. The newer shopping complexes have opened in the east as well, and all of this is less than a kilometer from the train station (which was undergoing significant renovation when I visited). As Bischofshofen was only a 45-minute train ride from Salzburg, it may well have positioned itself as an affluent suburb thereof, who knows? I also went across the river to the south bank and ventured some of the mountain trails there. Along with a closer view of the Alpine range shown in the first photo, there were several structures of note who took advantage of the higher hills to get more of the sun. The Missionshaus St. Rupert, below, was a prime example. It currently serves as a private school, and it advertises the use of its adjoining church for weddings. I didn’t climb further up the mountain, as it was getting dark, but from the river I noted several tiny villages and churches dotted the ridgeline. Given more time to walk the trails, I would have loved to visit them. Apart from the ski-jumping competitions, it seemed like Bischofshofen was better visited in the summer, when one can hike the mountains and gather the green sights of the valley from all around. Also, the town is a prominent stop on the Trauen-Radweg, the bike route that follows the Salzach River. Bischofshofen was a beautiful place to visit in the winter, and I hope I get the chance to go sometime in the future when those ski jumpers are in competition. (I’ll stick to the beginner’s jump, myself… maybe).